Norway and skiing are two things that can not be separated. Norway has a long winter, stunning natural contours, and the heavy snow that will make people very mad with Norwegian winter sport that one. In fact, the toddler had known Norwegian skiing since they could walk. When it’s the holiday to Norway in winter, you shall feel the experience of skiing with the local population, but when the summer comes and the snow has melted, you can experience skiing while visit Holmenkollen. Holmenkollen refers to a settlement on the outskirts of Oslo. The area became a favorite destination for winter sports and is always crowded when winter arrives. In addition, the Holmenkollen ski museum they have a history of over 400 years and skiing Ski Jump Arena which is used as the main arena for the 1952 Winter Olympics. 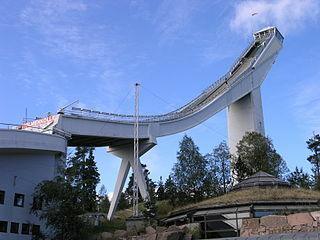 Now this used by Ski Jump for the annual FIS Ski Jumping World Cup is always awaited by the people of Norway. So famous Ski Jump Arena to become one of the landmark Oslo and often fill travel guides brochure photo. Size large arena Holmenkollen Ski Jump Arena makes could be seen from downtown Oslo. How to reach Holmenkollen is to use T-Bane towards Holmenkollen. Along the way, you will be treated to views of public housing and occasionally interspersed with views of the hills. Holmenkollen area including local elite and home prices here are more expensive than other Oslo area. Some deliberately foster homes right on the grass roof of their house as a system of traditional heating and cooling. During summer, the grass and the soil serves to cool the house and vice versa in winter serve to warm the house. Heavy rain fell while visiting Holmenkollen, thick fog straight down and make all the scenery looks blanketed in white. After the fall of the T-Bane in Holmenkollen, you have to climb a hill to get to the Ski Museum and Ski Jump Arena. The cold and slippery roads that uphill struggle will accompany you on this holiday. from a distance Ski Jump Arena already seen, the longer, the closer, and the building will look bigger. Because fog is thick enough, the view to the top travelers Ski Jump Arena will be blocked. From the middle of the Ski Jump Arena, you can see the ski glide slope used for the World Cup and the stadium where visitors watch this show. be imagined in the mind happens with speed glide slope and height like that. Not imagine how people who are not professionals in the ski will fracture if it dared to try and glide. You will shake your head for the adrenaline junkie who is obsessed with the sport. Ski Museum is located right in the middle of the slide Ski Jump Arena. Ski admission price to the museum is 100 NOK or free if using Oslo Pass. Ski Museum has two floors, most of the objects on display are ski boots, skis, and sled from age to age, mentioned also the material used to make the equipment. Chocolate bar Kvikk Lunsj travelers who often become a snack for in Oslo and an orange come to be the showpiece of the ski jackets for kids. Lunsj Kvikk chocolate and orange is a mandatory snack while skiing the Norwegian population. Elk statue also exhibited there. It is unclear what the reason why elk statue on display in the museum ski, but you will love these animals while on holiday in Sweden and Norway, because he always comes with a souvenir doll form. In this museum, you can also see elk in a standing position and is the size of the body is very large elk. In addition to the exhibits, Ski Museum offers another attraction for visitors, the Ski Simulator A peak and the view from Holmenkollen Ski Jump Tower. To Ski Simulator, visitors can experience simulated game Holmenkollen Ski Jump Ski. Guaranteed safe and not be afraid of fractures, to play this game, you have to pay 55 NOK or 45 NOK if using Oslo Pass. To see the view from the highest peak Ski Jump Arena, visitors just rode the elevator is available. Lift will walk sideways, according to the slope of the Ski Jump. From the top of Ski Jump Tower, visitors can see the sights around Holmenkollen, Oslofjord, Oslo City and awesome landscape.